Want to Attend USNA? Prepare Yourself Junior Year HS | USNA or Bust! Finish your IB Spanish requirement by taking summer school at the local community college. By July, you realize that it’s not as bad as you thought it would be. Take Economics—a required course to graduate high school. This will help with Academic Decathlon next year and free up your senior year schedule (you already have eight classes scheduled for first semester). No surprise that your friends take both Economics and IB Spanish with you—everyone trying to make room for classes. No soccer—you retired. Too many classes. Practice your violin. Another academic year of insufficient violining. By the end of this summer, after putting lots and lots of practice time in, you must decide if there’s a chance to pursue violin at the college level. Find a mentor for your science project. You meet with one of the University of California biology department heads, and he agrees to assist. Now you must collect the required raw data, and determine the workability of your project. You are surprised that none of your friends attempt this prestigious competition. It’s not only the opportunity to accomplish independent research; it’s the chance to be noticed by the outstanding universities that participate in the judging. As you work on this project, you hear from an acquaintance attending the California Institute of Technology. He tells you that most incoming Cal Tech freshmen completed independent science research in high school and he wishes he had. You visit a lot of colleges to cull what you like and dislike about the college experience. Tradition is important, as well as quality of professors, class size, and availability of up-to-date teaching materials. You want a residential approach—where most students live on campus all four years. And, it’s important that you can get a job at the completion. Do corporations respect the quality of graduate, and/or does the college market their graduates to the business community? Because of your family’s experiences, unemployment has become a great motivator. Summer comes and goes with the whoosh of virtual minutes flying by. You arrive at the new school year with a schedule that includes AP US History, AP Physics, English III Honors, Math Analysis, Academic Decathlon, Orchestra, Theory of Knowledge, Independent Study on your science research project, and Independent Study in Spanish (to prepare for the IB test). Some may think it’s a hard schedule, but all of your friends have the same load—or worse—so you are unfazed. You persevere with the outside honor orchestra, and as much community service as possible. Pundits preach that you can’t hold a job and excel in honors classes, but no one ever told you it was impossible, so you maintain your work schedule with Vons—ten to fifteen hours a week. Still Dad works as Mr. Mom, with little visible change in your life. Well, your brother went to work, and you do apply for as many scholarships as you can. Your friends continue to inspire you. Creative thinking remains alive and well junior year, making it easier to maintain the rigorous class load. You always find someone on Instant Messenger at two a.m. to help with a Physics Lab or a math problem. Many times, friends chide others naive enough to make excuses for incomplete work. Part of the Academy winnowing process is, who can complete all the steps in the application process. It is complicated and arduous. You must fill out a multi-page application, submit letters of recommendation, attain medical approval from DoDMERB, send transcripts and SAT scores, appear before a Congressional nominating committee and win their nomination, interview with the Academy representative, and pass a demanding Physical Aptitude Examination. When you think you have submitted all required documentation, you must follow-up, be sure everything got there as planned. If not, resend from the copies you made before mailing them out. If you can’t get through this process, they don’t want you anyway. You start with the relatively simple Summer Seminar application. February is time to apply for both the Naval Academy Summer Seminar and the Air Force Academy Summer Seminar. You’ve been told that admittance to the USNA Summer program is more difficult than to the Academy. 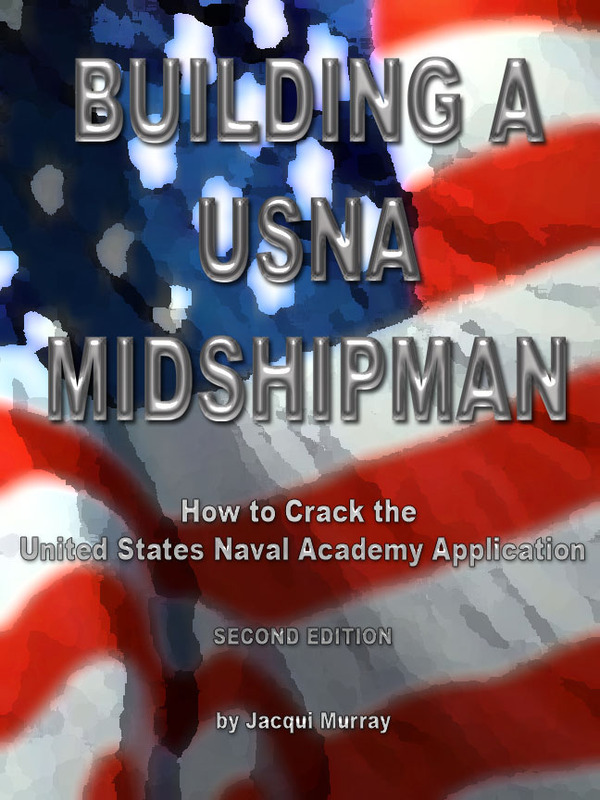 Acceptance to NASS predicts a 30 percent chance of getting in the USNA. Going online to the USNA Summer Seminar website is the easiest. Before you log on, you prepare a short essay outlining why you wish to go to the USNA. Now you go to the website, fill out all the questions, copy-paste your essay to the space provided online, and push send. Repeat this process for the USAFA. The AFA also wants a resume highlighting your accomplishments. You include your educational achievements—classes taken at the high school and the community college, your 4.4 GPA, your top 10 percent class rank (well, 10.1 percent), your SAT verbal and math scores (620 and 610), your AP test score (4 on AP Euro); your awards received such as scholar athlete for Varsity soccer, the many awards in Academic Decathlon, the Departmental Achievement Award in Chemistry, your research grant awarded by the American Association for Women Geoscientists, and the various music-related awards; your athletic awards for Varsity soccer and JV cross country, as well as the Second degree Black Belt in Karate; your many clubs; the voluminous community service (IB requires over one hundred fifty hours); leadership positions; work experience at Von’s; and extra curricular activities including your science research for the Siemens Westinghouse Competition, your first violin position with the Pacific Symphony Youth Orchestra, the National School Orchestra Award received two years in a row; and the hobbies you have little time for, like reading and computers. Now the hard part comes: You wait to hear. Maybe by March, or maybe later. The USNA offers three sessions, all of them at the end of your school year. You’ll have to rearrange all of your finals and graduate early. Make no mistake: The military academies see no problem with this. The type of candidate they want is one who can arrange and rearrange schedules with ease to allow for the most positive, successful outcome. And no excuses about how missing the last two weeks of school, including all of the reviews for the finals, will hurt your grade. They notify you in April: You’re in—both USNA and USAFA! You decide to attend USNA the first week of June, and the USAFA the second week of June. But first comes arranging the details (again, the devil is in the details): You get approvals from all of your teachers, get the principal’s blessing, schedule your early finals, study for them while maintaining your usual workload of homework, teach yourself critical Math Analysis material that will be on the final. And, as all AP/IB students know, those tests occur in May, forcing you to take finals while studying for and taking national examinations in AP US History, AP Physics, IB Spanish and IB Physics. How can you do all of this, and participate in end-of-year concerts for your three orchestras, most critically the high school’s where you carry the responsibilities of concertmaster. Once again, this must be doable, because Midshipman routinely perform the impossible, juggling physical and academic demands while earning their monthly stipend by serving in the armed forces. Naval officers are expected to evaluate data and come to the right decisions under highly stressful conditions, like conflicting demands and lack of sleep. You become nocturnal, studying until you’re done, often two or three in the morning, and catnap when possible during the day—snack, lunch, orchestra. Dhana sleeps at red lights, but that’s too scary for you. You won’t find out until July, but academically, you succeeded: Math Analysis came through with an A, paving the way for AP Calculus as a Senior, and you got the best grade you’d hoped for in AP Physics—a B. As expected, you earn straight A’s in the rest. Several of your friends head off to summer programs at Stanford or MIT. You’re off to summer seminars at the Naval Academy and the USAFA, and a three-week summer science program at the University of Notre Dame. By now, you want to go to all three of these great schools. Summer will make up your mind. In your free time, you’ll work on your Siemens Westinghouse science project (due October)—and practice your violin. Jacqui Murray is the author of the popular Building a Midshipman, the story of her daughter’s journey from high school to United States Naval Academy, and her debut thriller To Hunt a Sub. She is webmaster for four blogs, an adjunct professor on technology-in-education, an Amazon Vine Voice book reviewer, a tech columnist for TeachHUB, Editorial Review Board member for ISTE’s Journal for Computing Teachers, and freelance journalist on tech ed topics.